Once again the Eiffel tower became the inspiration for my romantic Valentine's Day tablescape! 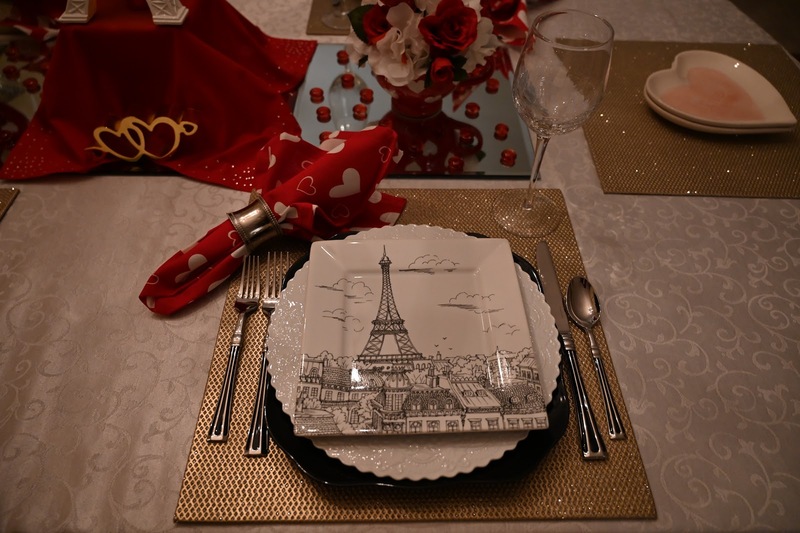 I used the Eiffel Tower for another tablescape in 2015 as seen "here" in case you'd like to check it out! This is what is underneath the red napkin. I flipped a candle holder over and used the square bottom which happened to be about the exact size for the Eiffel Tower. I wanted to raise it up higher and was glad I found something that could do the job! I also put some clear plastic stick-on feet to the candle holder so the ceramic wouldn't scratch or move on the mirror. As I began my thought process for this table I gathered all my dishes and accents together. I decided these oversized mugs would work great as vases. As you can see I used a half round styrofoam piece for my flowers. I picked up an oversized white hydrangea flower that I centered and a spray of red roses. I snipped the roses off and pushed them down here and there. I already had the glittery red hearts on sticks in my saved goodies. I shortened the sticks to fit each spot. Since I was preparing this a bit early before Valentine's Day I chose not to use fresh flowers. I assembled each on on this plate and had some glitter to clean up afterwards! Mirrors are easy to use, inexpensive and can create such a nice reflective and romantic element. The dishes were found at Hobby Lobby last year and are made by 222 Fifth which is a label I've come across at various places. These set the tone for a bit of a more contemporary tablescape design. I chose the white (Ralph Lauren) dishes because they reminded me of lace doilies. When we were kids those paper lace doilies were popular for Valentine's Day. The black dish has a bit of a square shape so I chose that to balance the look with the Eiffel Tower dishes. 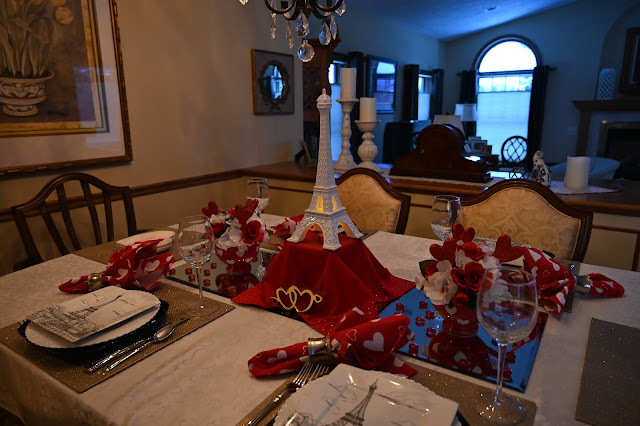 I chose to make the napkins flat and place them across the dishes to go with the angular lines created with the mirrors, place mats, and dishes. The flatware adds to the contemporary feel of this tablescape too. These clear crackle wine glasses from Pier 1 are another favorite. They always look great with red wine poured in them! 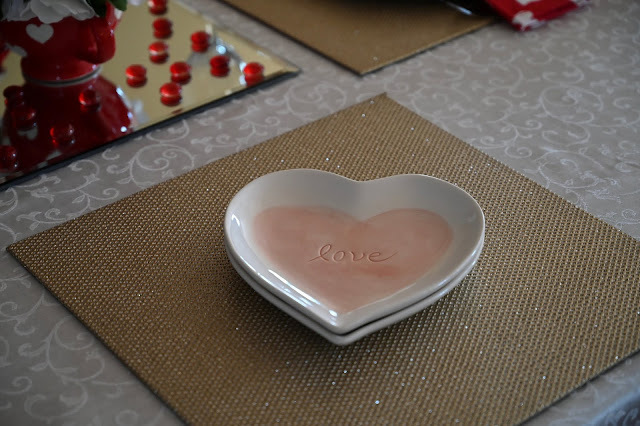 I used these dishes last year for my Valentine's Day table as seen "here". I added the two placemats on the ends with the thought that serving dishes could be used and then later some dessert. We've had so little sun I was grateful to capture some images with the bright sun flooding in the living room nearby. This table could be used for a luncheon with the girlfriends or in the evening with another couple for a more romantic mood. In the early evening the sun shines through and I captured a couple of nice shots! I added a tealight candle for some romantic lighting! I had these red colored tealights that I saved from Pier 1 that worked out well. The gold hearts have been in my stash for a few years which I got from Michael's. The red napkin is part of a set I bought from Pier 1 several years ago. Just to be different I removed the napkins and set them off to the corner. I like to explore different ideas. Now you can see the flatware better too! Go with what makes you happy! I hope you enjoyed my Eiffel Tower inspired tablescape and got some ideas for yourself! Please check out the other bloggers listed below for their inspirational Valentine's Day tablescapes! Thanks again to Chloe for hosting this blog-hop! Liz, tres chic and ooh la la for sure. The city of love and the Eiffel Tower are perfect symbols for Valentine’s Day! The mugs make wonderful vases to receive your flowers. 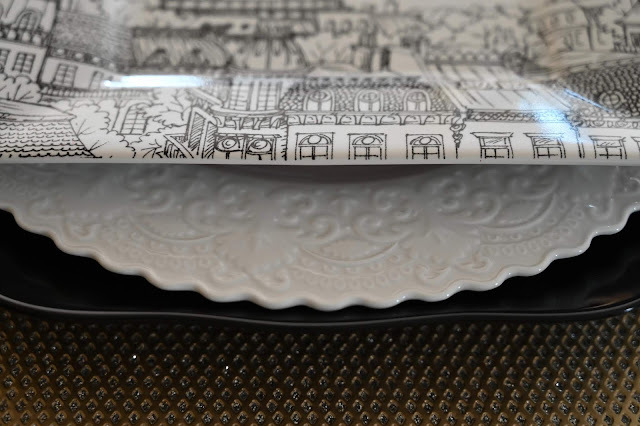 I have similar cityscape plates and they are always fun to use. Any friend or couple would feel pampered to sit at your lovely table. It is a pleasure to blog hop with you! 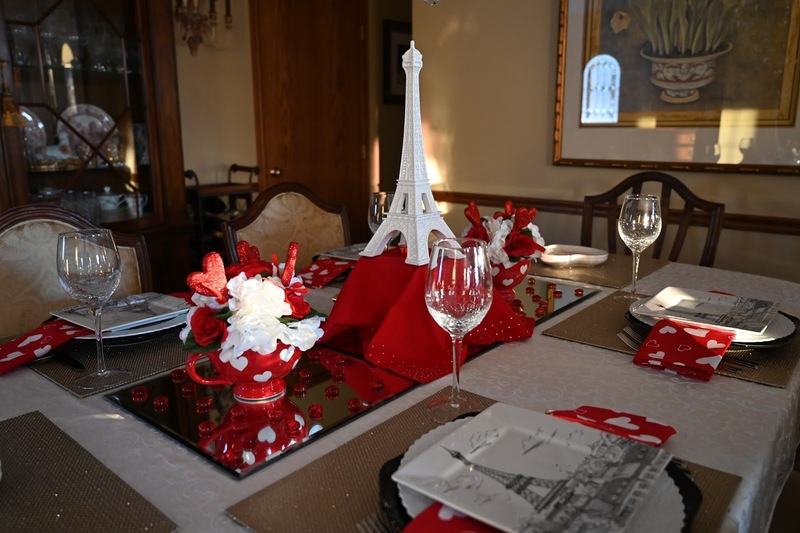 The Paris theme is popular on this hop this year, perfect romantic inspiration for Valentine's day. Those plates are fun, and I love your heart print napkins. Both ways you placed them look great. What a pretty, fun and romantic tablescape. 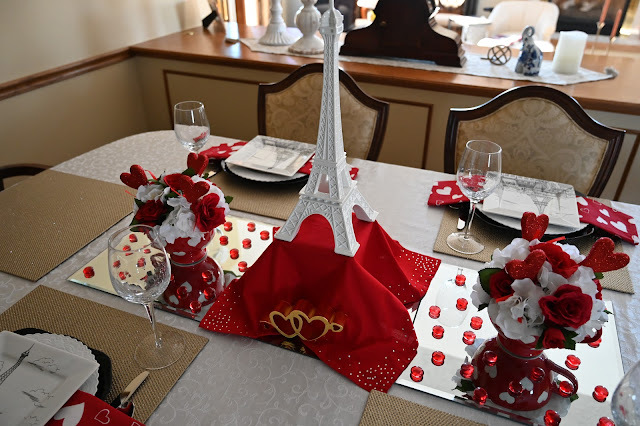 I love the Eiffel Tower theme and the way you elevated the centerpiece. Gorgeous. What a gorgeous tablescape! 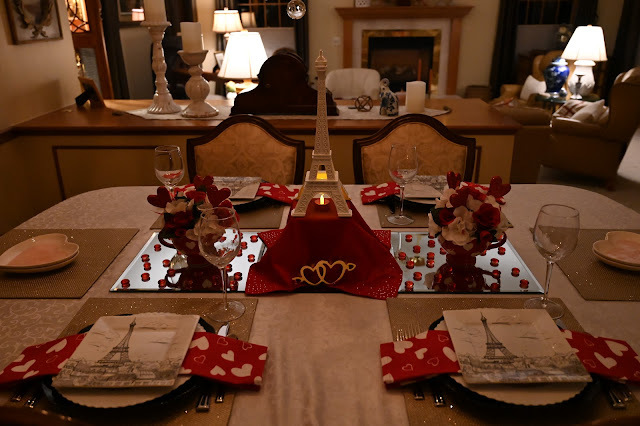 I love your Valentine theme since it brings back lovely memories of our trip to Paris and dining at Jules Verne at the top of the Eiffel Tower! It was truly a magical place! Ooh la la! 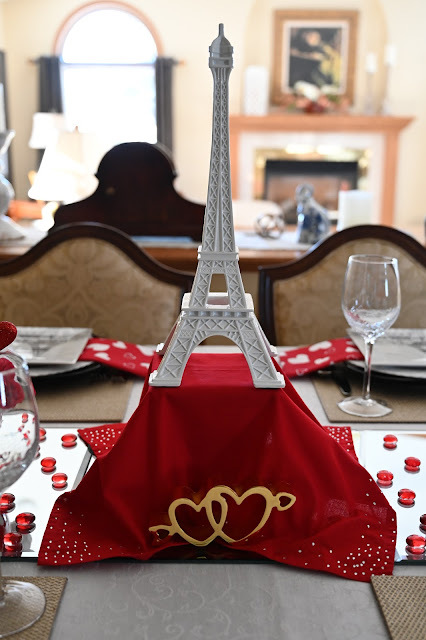 I love your Eiffel tower theme and how you elevated it for the table centerpiece! I think Paris is the most romantic place! Have a wonderful Valentine's Day! Delightful tablescape, Liz! Paris is one of my favorite cities! I missed those plates at Hobby Lobby! Shucks! Very creative to place the Eiffel Tower higher. Your flower arrangements in the mugs are perfect. The gold hearts below La Eiffel make it pop. I'm convinced that I should have at least one Eiffel Tower piece in my collection. 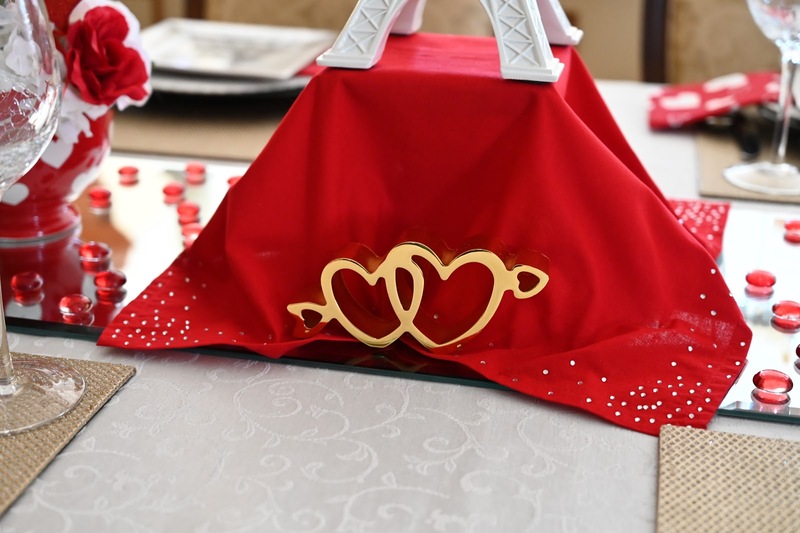 Elevating it on the overturned candle holder was a great idea and the pretty red napkin really sets if off. I love how you used lines and shapes to create a very cohesive look. 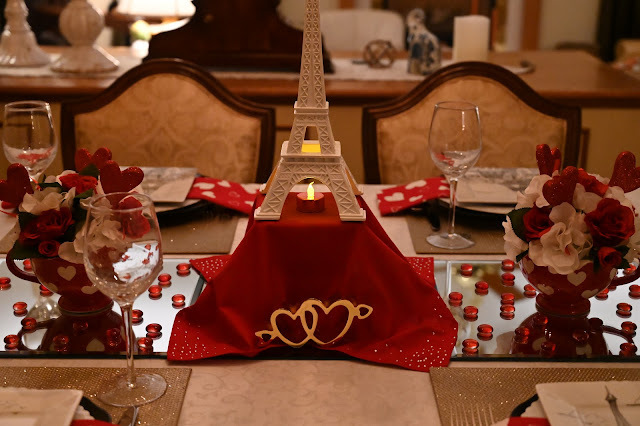 Another Eiffel tower tablescape and yet both are so different which is why I love these blog hops. Whatt can be more romantic than Paris?? Great job Liz. It is always a pleasure to tablehop with you. 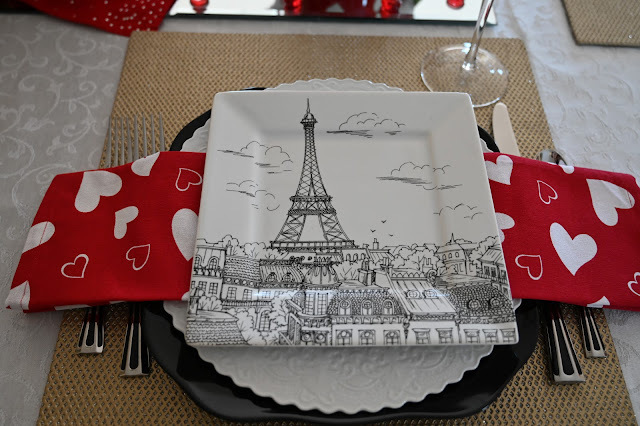 Well, anytime the Eiffel Tower is involved, I'm a happy camper so of course I'm wild about your romantic tablescape. I have one of those Tower plates. I wish I'd bought a set! 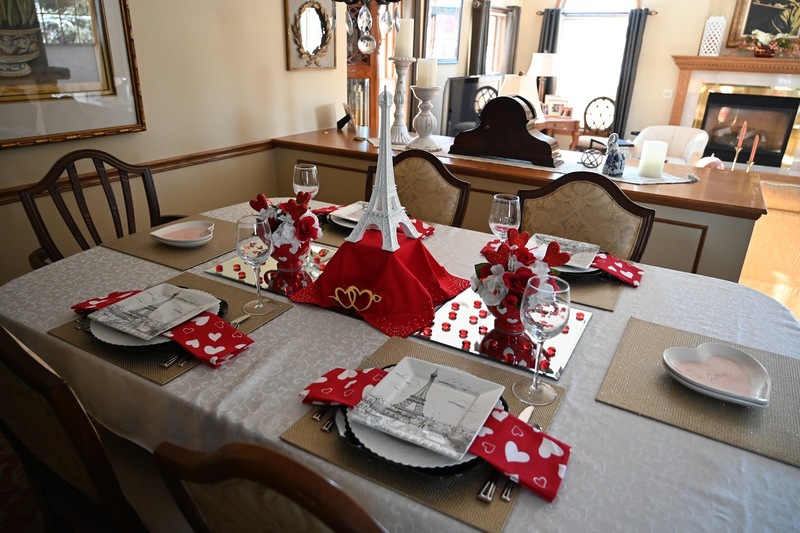 Bonjour Liz, I love that we both created interpretations of an Eiffel Tower inspired table this year --- great minds think alike? 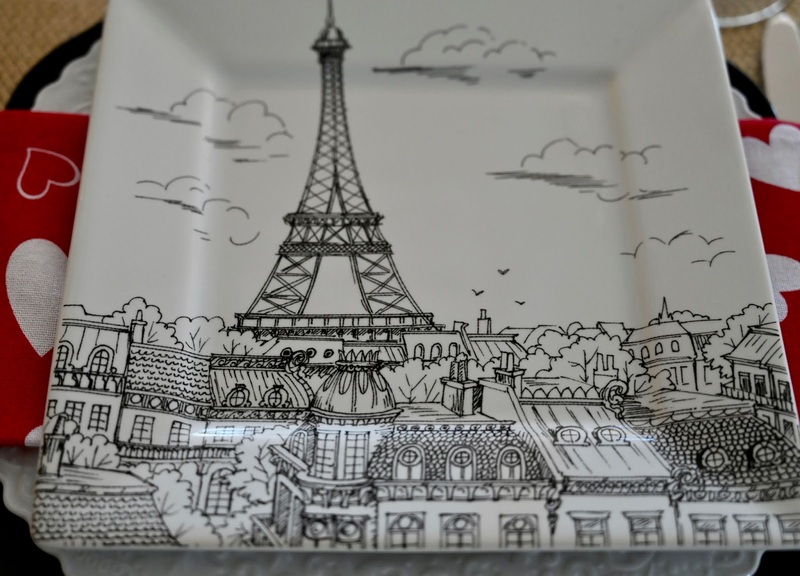 And with some of the same Parisian scene plates too. Especially like how you used the oversized red mugs as floral containers, as well as the way you positioned the red napkins across the plate stack --- tres chic mon ami! Oh la la Liz, Paris is definitely the city of romance! 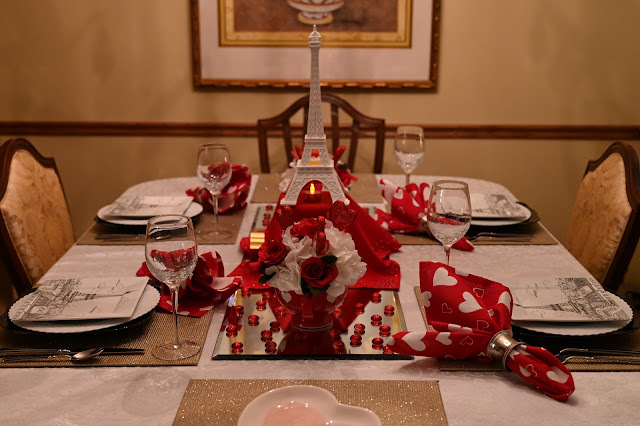 Love the Eiffel tower plates as well as the soft pink heart dessert plates~ the mirror table runner with the red glass confetti is really striking! Ooh la la, love your Parisian tablescape for Valentines. The plates are darling. The eiffel tower looks fabulous! I have one in black. The flowers are lovely in the mugs. Such a romantic table for you both. A pleasure to join you Liz. You have me craving french pastries now!! Thank you for taking me to such a romantic place, I have never been to the Eiffel tower! I love how you used those big mugs as vases. Your beautiful white plates do resemble doilies, that brings back memories of making Valentine cards as a kid, to me doilies and Valentines go hand in hand. It is always a pleasure to hop with you Liz!!! Liz this is too cute. I love those eiffel tower plates. Adorable. Happy Valentines Day. This is such a creative, festive table! I love all of the pops of red! You have created such a cozy, welcoming place to enjoy Valentine's Day! I am so happy to be on this hop with you! Ooh la la, What's not to love about a French~themed tablescape. 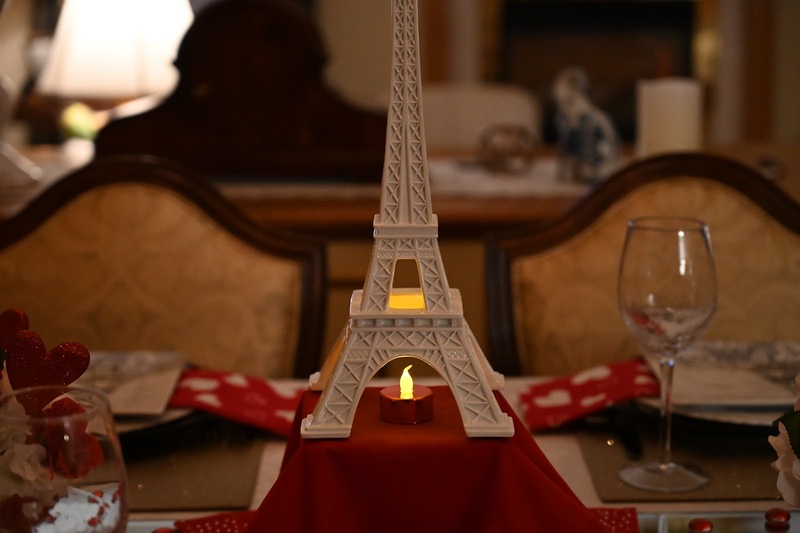 Your Eiffel Tower centerpiece is the piece de resistance. Love all the dishes and the red accents. Great to be hopping with you. Hi Liz! Your table is lovely, and you cannot possibly go wrong with a Paris theme. The white Eiffel tower is the perfect contrast to the red. Those dishes are fantastic! I know I have picked up many a 222 Fifth plate myself. Thank you so much for joining in another wonderful blog hop! So many fun ideas here, Liz! A Paris theme is so lovely for Valentine's Day. I'm going to have to check out what Hobby Lobby has this year - those plates are so cute! 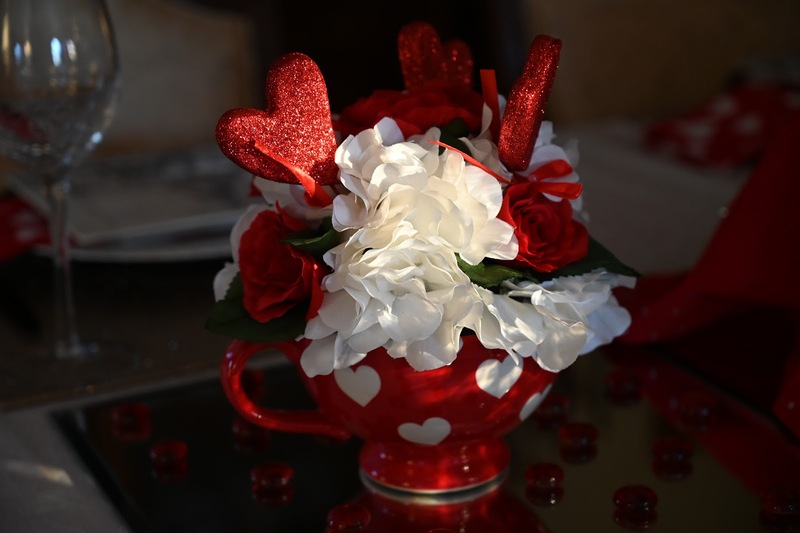 Thanks so much for sharing your table - Happy Valentine's Day! Liz, I am swooning over your Eiffel Tower table! 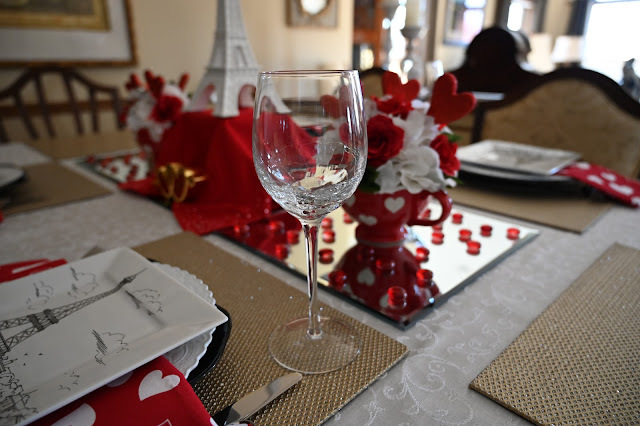 It is the perfect theme for a romantic table. Your floral arrangements in the sweet oversized mugs are so pretty and add the perfect touch to your table. It has been so much fun being on this hop with you! Happy Valentine's Day!!! Sunshine and Roses on a Winter's Day! 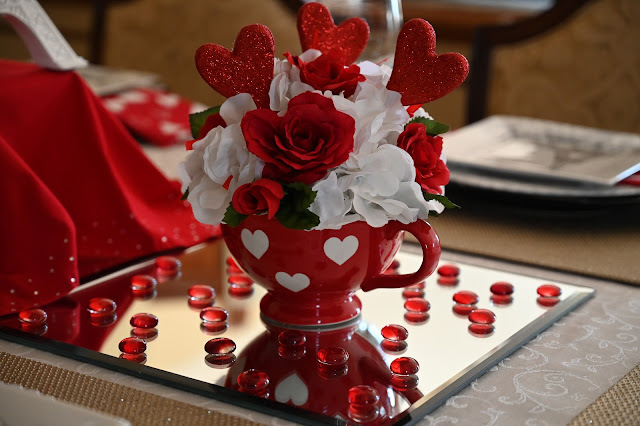 Valentine's Dining With You My Friends!